What do I do if the frames I like are out of stock? If a particular frame is out of stock, it’s worth looking at similar shapes and styles – try our Free Unlimited Home Trial to find out which frames suit you best in the comfort of your own home. The only vouchers we currently accept are by Accor/EdenRed (usually issued to you by your employer). We do not accept NHS vouchers at this time but we may still be better value than using this voucher at a high street optician. Who reviews and authorises my order? We have a team of qualified opticians who will carefully review your order to ensure that it is appropriately completed with prescription details, and that the frame and lens combination is suitable for your needs. For particular orders our opticians may need to contact customers with some follow up questions before processing the order, for example when ordering varifocals. Can I order my glasses over the phone? If you’re having difficulties ordering your glasses, call our team on 01793 746601 so they can help you. Do you sell glasses for children? No, it’s currently illegal to dispense glasses for children under 16 online. Can I use my contact lens prescription to order from you? Unfortunately not. Contact lenses work differently to glasses - you will have separate eye tests for contact lenses and for glasses, so your prescriptions will vary. It is important that you provide us with accurate information to avoid any problems with your glasses. How do I know if I’ve added a tint to my glasses? If you have selected one of these options, the additional cost will be itemised in your basket. If you can’t see this in your basket, then return to the lens options to select your requirements. If you have any queries, call to speak to one of our opticians on 01793 746601 who will be happy to help. How do I make sure I receive my Free Second Pair? When you reach your basket, you will see a reminder from us below your order. Remember! 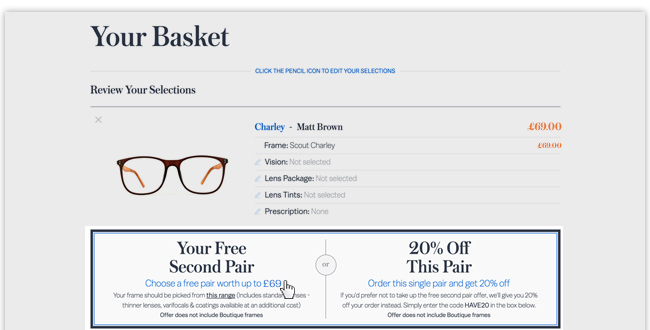 You have to select both pairs in a single order to receive the second pair for free. Please call our customer services team if you forget to add your free second pair on 01793 746601. For more details on our offer, click here. Subscribe to our newsletter towards the bottom of the home page: If after signing up you don’t receive our newsletter, check your email address is correct. If it is, try an alternative email if you have one. If you have previously unsubscribed, email us here to put you back on the list. If you’re still having difficulties, call our team on 01793 746601 who will be happy to help. Scroll to the bottom of your email from us and select ‘click here to unsubscribe’.